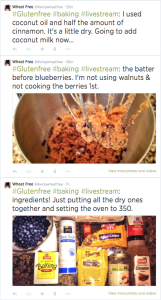 Check it out: livestream baking and cooking, and you can suggest something to make! Follow me @livingwheatfree. I’ll tell you what time I’m baking, what I’m baking, and where you can find the recipe. Lots of pictures! Suggest what I should livestream bake or cook next on Twitter or in the comments! Can’t wait to hear your comments and suggestions! Thanks, Daisy! I’m excited about it. See you there!